Home » Mazda CX-3 » New Mazda CX-3 Upgrades Comfort, Performance and Style! The subcompact crossover segment has grown in popularity and the athletic 2018 Mazda CX-3 has cemented its status as a fan favorite with an athletic personality, a sporty style, an affordable price tag and a wealth of innovative features. With the debut of the 2019 Mazda CX-3 at the New York International Auto Show, the Mazda crossover is more attractive, more comfortable and more fun to drive than ever. Learn more with this overview of the official 2019 Mazda CX-3 release date and design specs at Earnhardt Mazda Las Vegas. READ MORE: What Are the Updates and Changes to the 2018 Mazda6 Design? When Will the 2019 Mazda CX-3 Arrive in Las Vegas? Are you drawn to the head-turning style and athletic performance of the 2019 Mazda CX-3? Look for the latest Mazda CX-3 to arrive at Earnhardt Mazda Las Vegas in the spring of 2018. When the updated Mazda CX-3 arrives, it is expected to be available in three grades – Sport, Touring and Grand Touring – that each promise tremendous value with an affordable price tag and an arsenal of standard features. What’s New for the 2019 Mazda CX-3 Design? 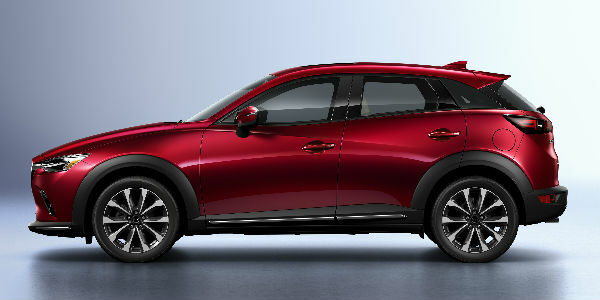 Tailor-made for the driver who is drawn to an athletic performance, the 2019 Mazda CX-3 features a dynamic design that possesses a long hood, large wheels and wide stance that lend themselves to an active lifestyle and will turn heads. A retuned suspension and refined power steering contribute to a smoother, more agile ride and are complemented by an upgraded 148-horsepower 2.0-liter SKYACTIV®-G four-cylinder engine. Armed with standard G-Vectoring Control and stylish 18-inch wheels, the Mazda CX-3 promises to amp up your daily commute. Inside the 2019 Mazda CX-3, you will discover a wealth of upgrades that are destined to improve comfort, style and connectivity. A redesigned center console makes more room for wider, more comfortable front seats that are now available with white or black premium leather upholstery. Additional highlights of the Mazda CX-3 interior include suede touchpoints, red louver accents, improved storage and the standard MAZDA CONNECT™ infotainment system complete with a 7-inch touchscreen display. Exterior upgrades include new LED taillights, Piano Black accents, 18-inch wheels, chrome trim and a new front grille. READ MORE: What’s New for the 2018 Mazda CX-5? A perfect combination of style and athleticism, the 2019 Mazda CX-3 is a class leader in the subcompact crossover segment. Learn more about the latest Mazda subcompact crossover with this guide to the official 2019 Mazda CX-3 release date and design specs. Visit the Earnhardt Mazda Las Vegas inventory this spring and slide into the driver’s seat of the new and improved 2019 Mazda CX-3! This entry was posted on Wednesday, April 4th, 2018 at 6:56 pm	and is filed under Mazda CX-3, Mazda Vehicles. You can follow any responses to this entry through the RSS 2.0 feed. You can skip to the end and leave a response. Pinging is currently not allowed.